A recruit of Charlie Company, 1st Recruit Training Battalion, makes his phone call home, reading only what is printed on the sheet of paper provided by Marine Corps Recruit Depot San Diego, October 20, 2014. Recruits will not be able to make another phone call until the end of recruit training. All new Marine recruits make a phone call home after arriving on the Recruit Depot. The sole purpose of this first phone call is to notify the family that their recruit has arrived safely. There has recently been a change to the first phone call for recruits. They still have a short scripted message to say, but at the end the parents are given a chance to ask a quick question. Also, the Drill Instructors are not screaming at them while they make their phone call. I have arrived safely at Parris Island. Please do not send any food or bulky items. I will contact you in 7 to 10 days via postcard with my new mailing address. Now the recruits can tell their family they love them and give the parents some comfort. **Disclaimer**-- This change is not a written policy but more of an unwritten rule that is left to the discretion of the drill instructors. Some will allow recruits to make their phone call quietly without stressing them out. Others will keep the old school approach and continue to yell in the background. When your recruit first arrives, you might be awakened during the night to hear your recruit reading a scripted message. Your recruit may be speaking quickly and sound tired or hoarse. You won't have time to ask questions so just listen and let your recruit know you've heard and understood his conversation. I snuck in an "I love you" too. I didn't get a phone call from my son. He was so nervous when he got there that he couldn't dial the number or use the calling card correctly. So, when the Staff Sergeant asked if he made the call, he said yes. I was nervous about not having heard from him, but got a letter from him later that put my mind at ease. After getting that first "I'm here" call, families often want to know when to expect the next call. It is difficult, if not impossible, to predict if or when recruits will make a phone call home during boot camp. As much as you would like to get a phone call, I recommend repeating "no news is good news". That might sound trite, but it's the truth. 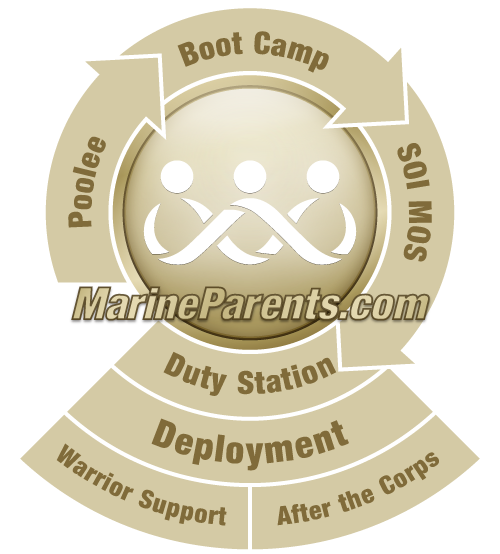 If your recruit has to be put back in the training cycle due to illness, injury, failure to pass physical fitness tests, swim qualifications, rifle qualifications, etc. you will get a phone call... which is why I say, "no news is good news". Unless you have received a call telling you otherwise, you can assume your recruit is doing well and has not fallen behind.